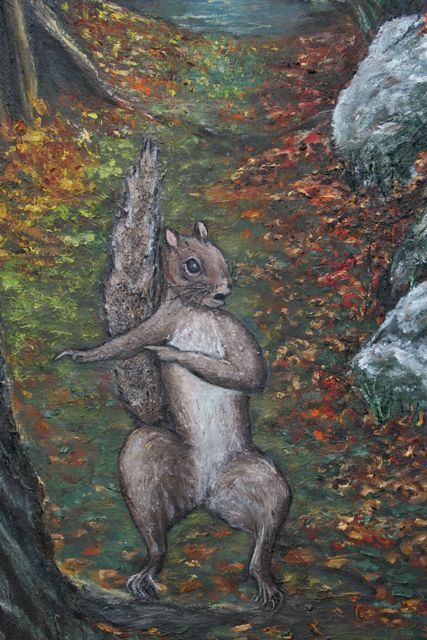 In honor of a myth-based story my husband is writing about a group of squirrels, I did a painting for him, of one scene in the story. I won’t share the story or its details, as that is his creation, and his only to share. However, the painting is mine 🙂 so I will share some shots. 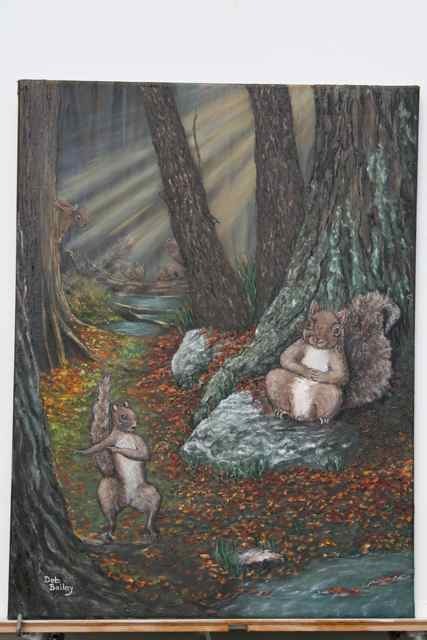 The first is the overall painting shot of a scene deep in a New England woods, where the elder squirrel is listening to a vital piece of information being shared by the younger “thin tail” squirrel. Suspicious of the younger squirrel’s wisdom, older, “assistants” to the elder watch the proceedings with suspicion in the background. The rest of the pictures are closeups of various parts of the scene. I will note that the three right side trees took me FOREVER, because I just couldn’t get the textures and shadings correct. At one point I actually took sandpaper to those three tree trunks to sand off dried paint because I could no longer add more paint to the surface and I just wasn’t satisfied with the results. I went outside countless times to stare at pine trunks and oak trees and lichens on tree bases, in an effort to get it right. Finally I was satisfied. I was REALLY pleased with how the left hand “cedar” type tree came out, that one just came with ease, as did the squirrel hanging onto its side. 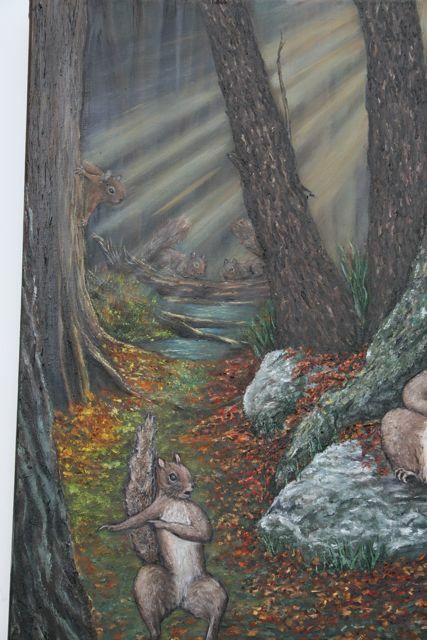 The two background squirrels required a lot of fidgety reworking, as did the rocks. 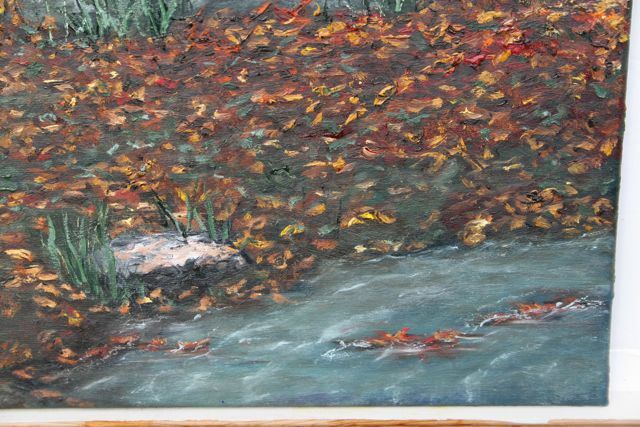 On the flip side, I was VERY happy with the water and leaves in the water, on the right side. The water was several layers of color, but it came with ease and the leaves floating on its surface came out right in one take. 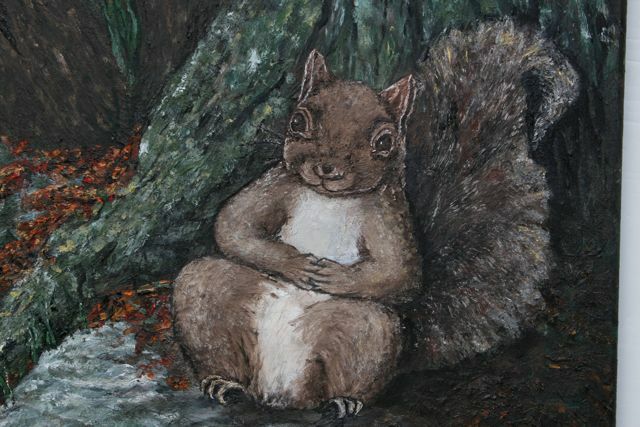 The two front squirrels, the thin tail, and the elder, took a long time, many layers and reworkings….I’ve never done animals before in oil paints. 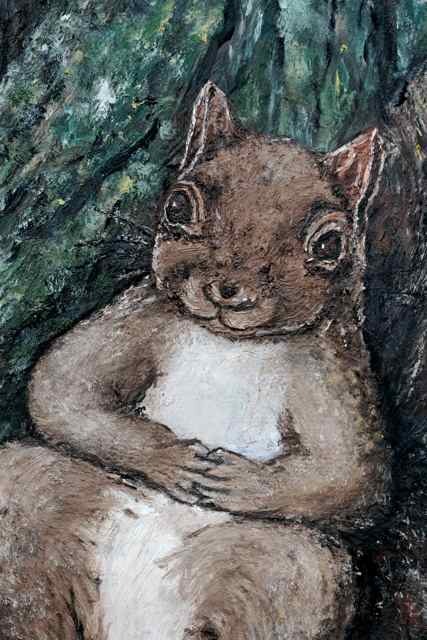 And the face on the elder looked more like a dog at one point….you have to remember that squirrels have their eyes on the sides of their head, unlike dogs whose eyes are both in front when they stare at you. Again, I just painted over the elder’s face and started over until it came out well. The other difficulty with this picture was its overall lighting. The background is bathed in sun rays and hence has a distant washed out kind of effect. And the lighting is all in the background and from the side, which made figuring out how to paint the front of the painting, which was all in shadows, a problem. 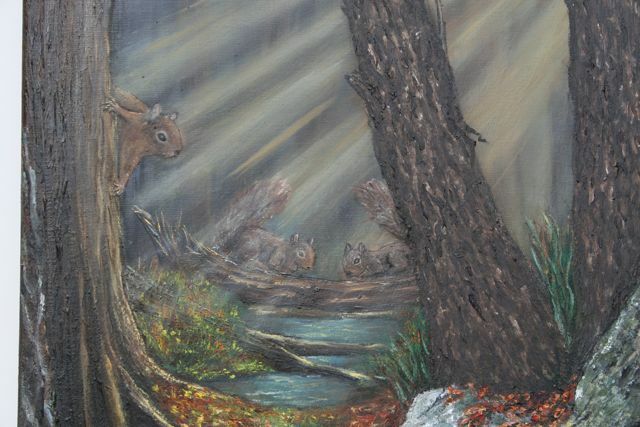 How do you reveal details when the light is behind the front area of the painting and hence the front is all in shadows? Perhaps a mistake on composition, but I wanted a challenge and it sure gave me one. You are currently browsing the Soul Mosaic blog archives for December, 2008.